∧ 샤갈. 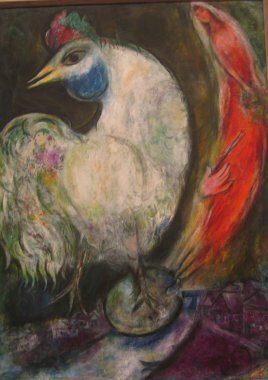 Chagall, Marc, National Museum of Modern Art, Paris. ∧ 샤갈. 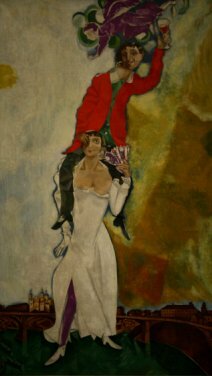 Chagall, Marc, Double Portrait au verre de Vin, 1917, National Museum of Modern Art, Paris. 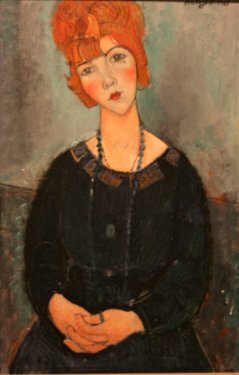 모딜리아니, Modigliani, Amedeo (1884-1920): 이탈리아 태생의 화가로 1906년부터는 파리에 정착했다. 주로 여자의 그림을 자주 그리고, 그릴때 길게 그리었다. Italian painter and sculptor who settled in Paris (1906), where he concentrated on chiseling heads in stone and painting portraits, mostly of women, in a characteristic elongated style. ∧ 모딜리아니. Modigliani, Amedeo, Gaston, National Museum of Modern Art, Paris. ∧ 모딜리아니. Modigliani: Woman with a necklace, Art Institute of Chicago(프랑스 박물관이 아님, Not from France). 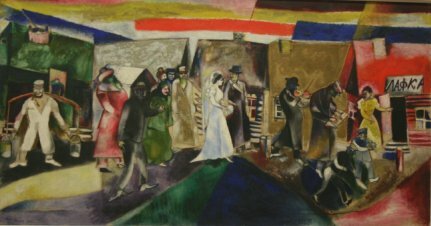 레제, Leger, Fernand (1881-1955): 프랑스의 입체파 화가. French painter. One　of the early cubists; his obsession with machinery led to his being called "the primitive of the machine age." ∧ 레제: 꽃다발을 들고 있는 두 여인. 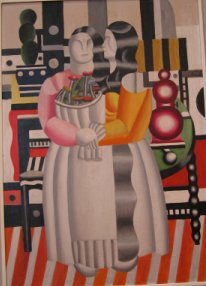 Leger, Fernand, Two Women with a Bouquet, 1921, Museum of Fine Arts, Lyon, France. 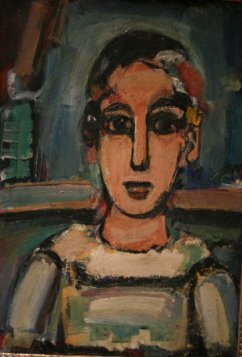 조렌스키, Alexej Georgewitsch von Jawlensky (1864?1941): 러시아의 표현주의 화가로 독일에서 활약함. 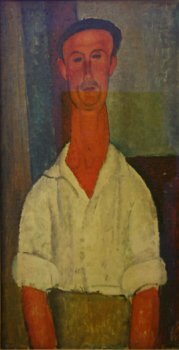 He was a Russian expressionist painter active in Germany. 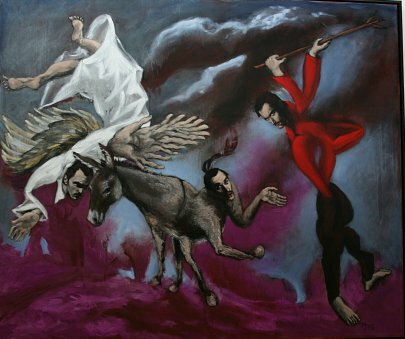 He was a member of the New Munich Artist's Association, the Blue Rider group. ∧ 조렌스키: 한 여인의 머리 (머리털이 뱀 모양인 메두사). 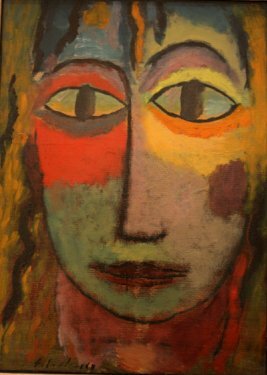 A. Jawlensky: Head of a Woman ("Medusa"), 1923, Museum of Fine Arts, Lyon, France. 12. 마티스/루오/피카소. Matisse, Rouault, Picasso. 2008/05/07 오후 11:48 | 프랑스 박물관. 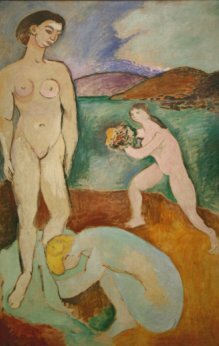 마티스, Matisse, Henri (1869-1954): 프랑스의 화가; 포비슴(Fauvism) 운동의 대표자. 포비슴은 소위 '야수파'로 20세기 초의 프랑스 회화의 한 유파다. 강한 표현주의를 표방하였다. 야수파에는 뒤피, 마티스, 루오 등이 속한다. 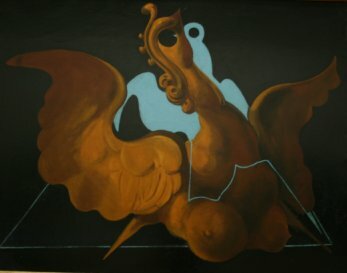 French painter and sculpturor. After studying under Gustave Moreau, he led the artistic group of fauves after 1905, with colorful, strongly patterned, and often distorted portraits, still lifes, and nudes. 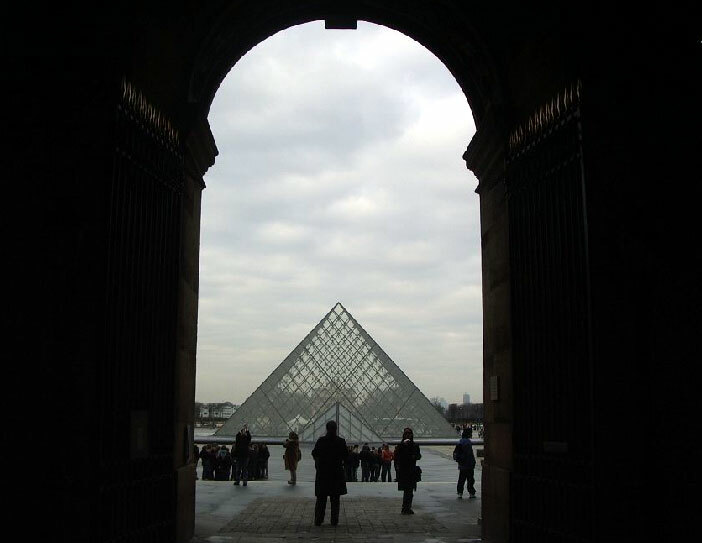 He was also influenced by impressionist, cubist, and Islamic art. Fauvism is an art movement originated in Paris in 1905 as a revolt against impressionism, characterized by simplified form and the use of vivid colors. 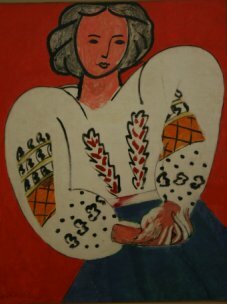 Its members included Dufy, Matisse, and Rouault. ∧ 마티스: 흰 옷을 입고 기대어 있는 젊은 여인. 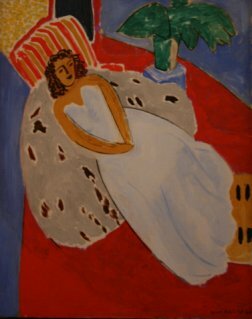 Matisse, Henri, Young Woman in White, with Red Background (Reclining Model, White Dress), 1946, Museum of Fine Arts, Lyon, France. ∧ 마티스. 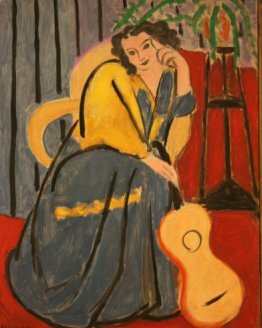 Matisse, Henri, Le Luxe I, 1907, National Museum of Modern Art, Paris. ∧ 루오: 복받은 광대. 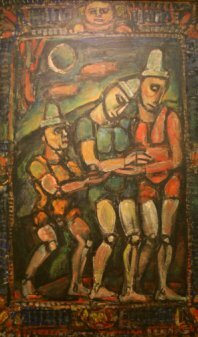 Georges Rouault, Le Clown Blesse, National Museum of Modern Art, Paris. ∧ 루오: 피에로. Georges Rouault, Pierrot, 1937-8, Museum of Fine Arts, Lyon, France. * 피에로: 프랑스의 무언극에서 나온다. 피에로는 복장을 한 어릿광대; 가장무도인을 뜻한다. Pierrot: A stock male character in traditional French pantomime having a whitened face and floppy white clothing. 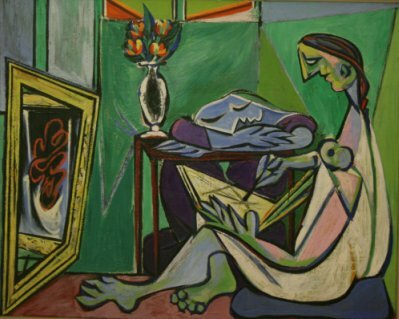 피카소, Picasso, Pablo (1881-1973): 스페인 태생의 프랑스 화가, 조각가. 입체파 예술가이다. Spanish painter, perhaps the most prolific and versatile artist of the 20th century. He initiated Cubism. ∧ 피카소: 무사 (Muse). Picasso, Pablo, La Muse, National Museum of Modern Art, Paris. * 무사, 뮤즈; 그리스 신화에서 Zeus와 Mnemosyne 사이에 태어난 9자매로, 학문, 예술 등을 맡은 여신이다. Muse: In Greek mythology, any of the 9 daughters of Mnemosyne and Zeus, each of whom presided over a different art or science. ∧ 피카소: 해변가의 여인. 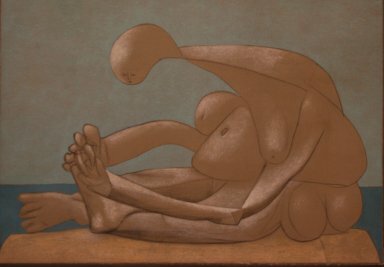 Picasso, Pablo, Woman Seated on the Beach, 1937, Museum of Fine Arts, Lyon, France. 13. 에른스트, 이외. Ernst, & others. ∧ 에른스트: 키메라. Max Ernst, chimera, 1928, National Museum of Modern Art, Paris. * 키메라: 그리스 신화에서 나옴. 사자의 머리, 염소의 몸, 뱀꼬리를 가진 불을 뿜는 괴수. Chimera (Greek mythology): A fire-breathing she-monster usually represented as a composite of a lion, a goat, and a serpent. ∧ National Museum of Modern Art, Paris. ∧ Museum of Fine Arts, Lyon, France. ∧ 우드, 미국의 화가: 미국의 고딕양식(?)". Grant Wood, American, 1891-1942, American Gothic, 1930, Art Institute of Chicago (프랑스 박물관이 아님, Not from France). * "American Gothic, 미국의 고딕양식(? )"이라는 이 그림에서는 미국의 고딕양식으로 지어진 집 앞에 서 있는 아이오와(Iowa)주의 농부와 그의 노처녀 딸을 그리고 있다. 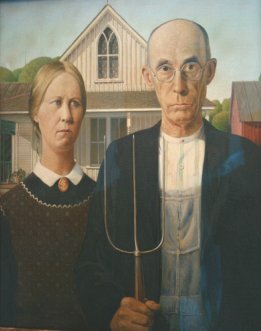 American Gothic depicts a farmer and his spinster daughter posing before their house, whose gabled window and tracery, in the American gothic style, inspired the painting's title. In fact, the models were the painter's sister and their dentist. Wood was accused of creating in this work a satire on the intolerance and rigidity that the insular nature of rural life can produce; he denied the accusation. American Gothic is an image that epitomizes the Puritan ethic and virtues that he believed dignified the Midwestern character(quoted from the Museum).